Bundesliga sides have seen another year of great growth on digital platforms. Twenty teams (VfB Stuttgart and Hannover 96 got relegated in the summer, SC Freiburg and RB Leipzig were promoted) added 21,465,892 online fans to their existing digital communities. Especially FC Bayern, now one of the Top5 European Digital teams, recorded an online fan base increase of 12,450,714 followers and likes in the entire calendar year of 2016. And again, Facebook has achieved strongest growth, with a total 52,19% (6,498,090 likes). Facebook extends its role as core social platform for the Bavarian club. The second strongest platform for FC Bayern is Instagram, where the German record title winners added 3,847,950 followers. On Twitter FC Bayern was enable to increase the community by more than one million followers, adding a total of 1,026,472 fans on the fastet digital platform, while the YouTube channel grew by 176,572 subscribers. FC Bayern offers content and news across more than 30 digital channels, most notable growth during 2016 was achieved on Chinese platform SinaWeibo, where the club achieved a growth of 676,039 followers. This number is found in the “All Others” column – only one platform recorded a fan decrease last year, Tencent (-58,256 fans). Borussia Dortmund recorded an increase of 4,072,616 likes and followers during the past year. Not reaching the same global level of FC Bayern, but still quite far ahead of all other Bundesliga clubs. Instagram has recorded the strongest growth for Borussia, growing by 1,734,966 followers. The Facebook profile did increased by 1,370,705 likes, which meant surpassing the 15 million fan milestone in December of 2016. On Twitter Borussia Dortmund follows quite a unique approach, being the only team in the Top15 Digital European Clubs offering only one single channel, while all others do offer a variety of dedicated language profiles. The YouTube channel added 53,700 subscribers and all others gained 354,278 followers, with SinaWeibo again being the strongest platform (increase of 270,873 followers). Bayer 04 Leverkusen is the third and final Bundesliga exceeding a growth of more than one million followers and likes during 2016, by a margin of 32,000, adding in total 1,032,533 fans to its online fan base. Facebook was best performing platform for Bayer 04, growing by 696,971 likes during the past year. Twitter performed well and was second best perform digital platform for Bayer, adding 195,323 followers, while Instagram in third increased by 128,245 followers. Newly promoted RB Leipzig was the best of the four clubs, with a Bundesliga presence of only six months in 2016. First time ever in the Bundesliga, the club from Leipzig added 225,539 fans, which overall meant 12th position. While VfB Stuttgart and Hannover 96 unfortunately faced relegation from Bundesliga in May, their online communities fully trusted their club activities and continued to grow during the entire year. In fact, VfB Stuttgart reached 13th with a total growth of 221,128 followers and likes. 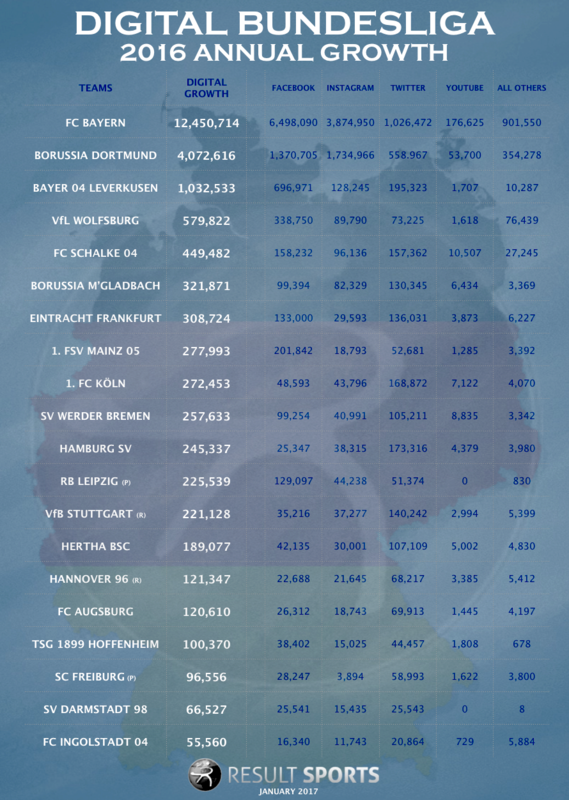 Hannover 96 came in 15th position, adding 121,347 followers to its communities. Concluding the analysis, Facebook (plus 10,034,156 fans) remains with 46,74% of the overall 2016 growth (21,465,892 fans) the core social platform for Bundesliga clubs. Second platform within the Bundesliga is now Instagram, surpassing Twitter during the past year. Twenty Bundesliga clubs aggregate now 14,007,136 followers on Instagram, a growth of 6,348,905 followers in 2016 (29,58% of the total digital growth). The feature evolution on smartphones pushes Facebook and Instagram, with Facebook Live, Instagram stories as key value propositions towards the clubs, while Twitter remains challenging for clubs to commercialise and the overall 2016 technology evolution has not seen a significant enhancement.